The technology is so prominent it is available on even the most accessible models. If there’s any remaining doubt that autonomous cars will one day prowl our road network, the technology behind lane guidance systems should have even the biggest non-believers ready to welcome our robot overlords. Already our cars can accelerate, brake, drive in traffic, maintain a safe distance from the car ahead, park, read and identify road signs and alert us should they need servicing all by themselves, but the ability to follow road markings and stay within their lane, no matter whether you’re travelling in a straight line or around corners, is the biggest piece of the autonomous puzzle falling into place. It began, as always, in tech-focused Japan back in 1992, when Mitsubishi unveiled a rudimentary camera-operated system that could track lane markings and would alert the driver if it sensed the car was drifting out of its lane. Offered on the not-for-Australia Debonair, it was the world’s first lane departure warning system – technology that is so prominent across Australia’s new car market today, it’s available on everything from the accessible Hyundai Sante Fe to the considerably less-accessible Mercedes-AMG GLE 63. It does make a driverless future feel absolutely inevitable. 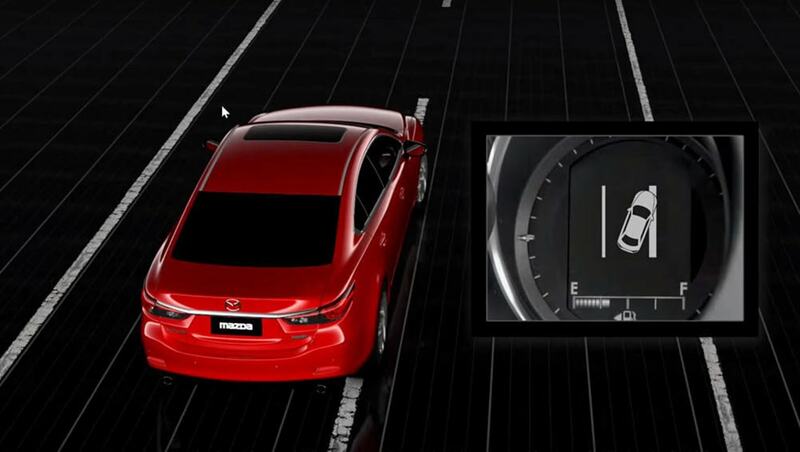 The technology behind the system hasn’t changed all that much in the many years since: a camera, usually mounted above the windscreen, scans the road ahead, recognising the dotted- or straight-line lane markings to the left and right of your car. Should you begin to stray onto or over the lines without using your indicator, the warning part kicks in, be it via an audible chime, a dash light or by sending a small vibration through the steering wheel. It would be another 12 years before the technology evolved to the point where it was able to not only identify a human error, but also take steps to correct it. That breakthrough occurred in 2004 in a system fitted to Toyota’s Crown Majesta. It used the electric power steering motor to counter-turn the wheel to keep you on the straight and narrow if it sensed you were drifting out of your lane. Also known as lane keeping assist, lane assist or lane assistance, the technology is not without its detractors. Some say lane keeping is a non-negotiable skill of all drivers, and if you can’t do it yourself, then you’re better off on the bus. While others bemoan the sensitivity of the technology, as they find themselves fighting against their own steering wheel when their vehicle incorrectly decides they’re leaving the lane. Most systems, however, can be switched off, leaving you in complete control. The technology evolved again with the launch of Tesla’s much-hyped Autopilot mode in 2015. Using 12 ultrasonic sensors positioned around its Model S sedan, Autopilot mode allows the car to take over a number of functions that once required a human driver’s input, including managing its speed, steering, brakes and even changing lanes. While not an end-to-end solution – you can’t just jump in your car in your driveway and order it to work, the system will only engage under a specific set of circumstances – it does make a driverless future feel absolutely inevitable. And when that happens, human drivers, like all outdated technology, will become redundant. Do you welcome our robot overlords? Tell us what you think in the comments below.